It’s been a couple weeks. let’s check in at the vegetable garden. I have been busily weeding, training vines, picking bugs, thinning rows and hoeing up the dirt around the bases of plants. The weather has been quite warm with many days in the mid-eighties to nineties F. Scattered thunder showers have provided adequate water. Everything in the garden is growing with abandon. Miniature pumpkin vines in the foreground and field pumpkins in the back. Little fruit are already setting. This humid, hot weather is corn’s favorite growing condition. 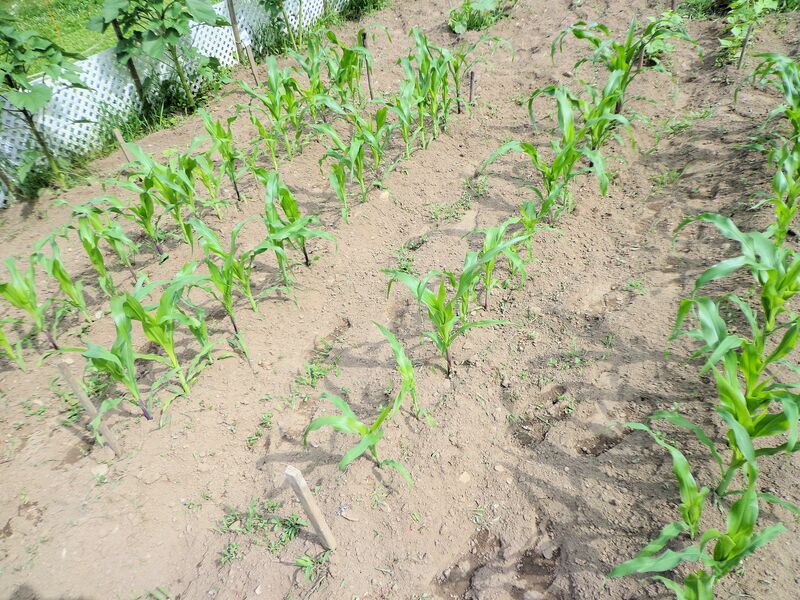 If you watch carefully, you can see the indian corn get taller! A sunflower, winter acorn squash, red sweet peppers, beets and a row of carrots along the fence. I have harvested loads of beet greens, eaten much and given more away to friends and relatives. I even made some pickled beets! The peppers are very happy this year. Last year they mostly failed. This time I planted them closer together, about 8″ apart. They are in the shade of the corn for much of the morning and have the beets nearby for humidity. 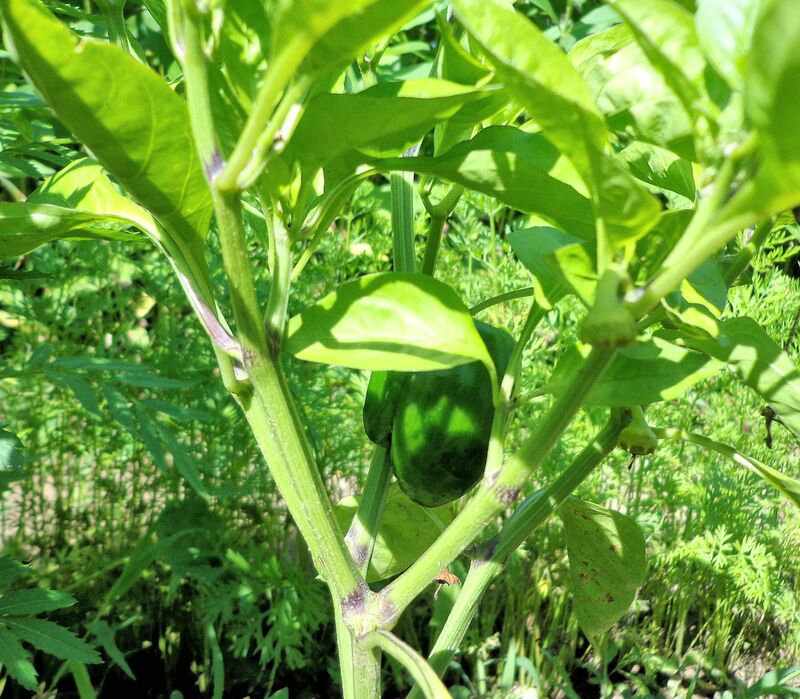 Peppers like moisture and partial shade. Several plants have good-sized fruit. I may eat one now and not wait for it to turn red! The bush wax beans are in full bloom. I expect to find beans waiting to be picked any day. The first tomato, right on schedule. Think I’ll pick it for my salad today, before some slug or mouse can chew a hole in it. Lettuce, anyone? 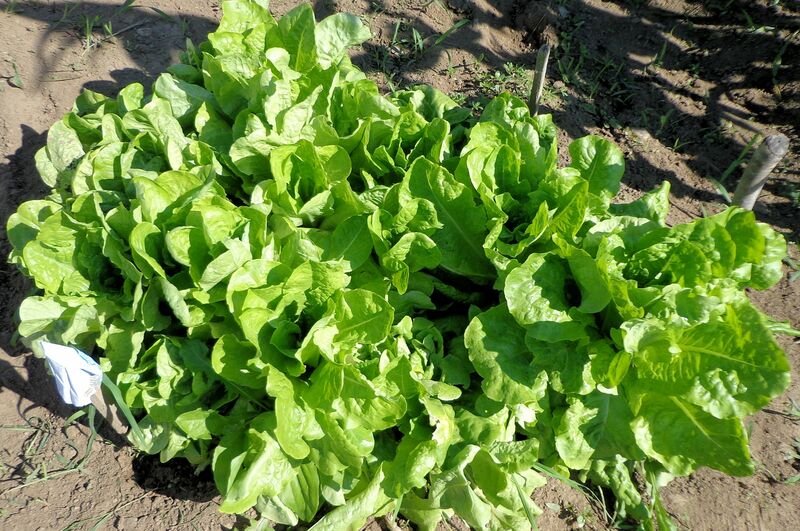 This is head lettuce. I let it grow close together and thin as I need lettuce until just a few large plants are left to make heads. 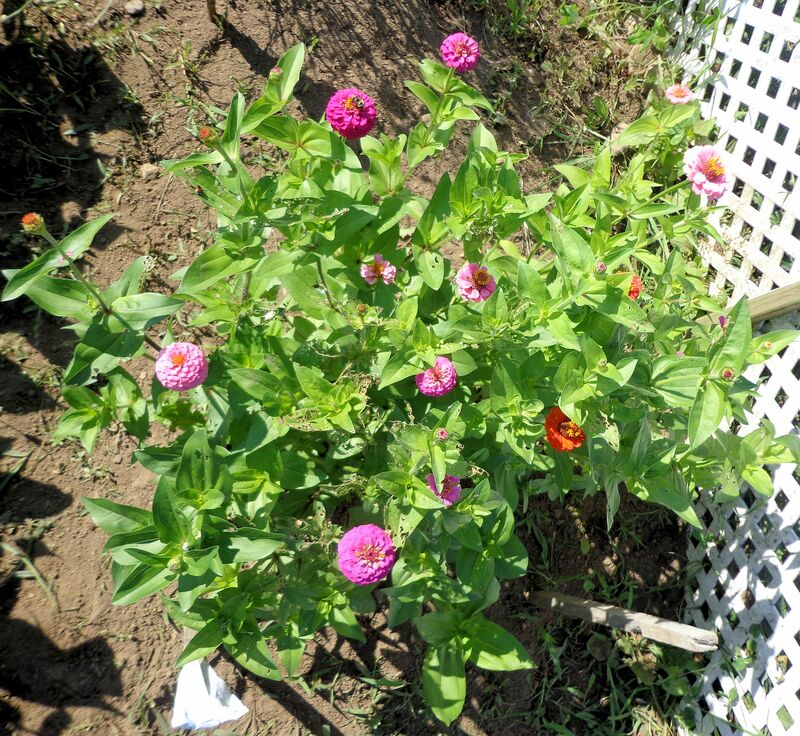 Bachelor buttons, marigolds and zinnias to brighten the garden and provide cut flowers. 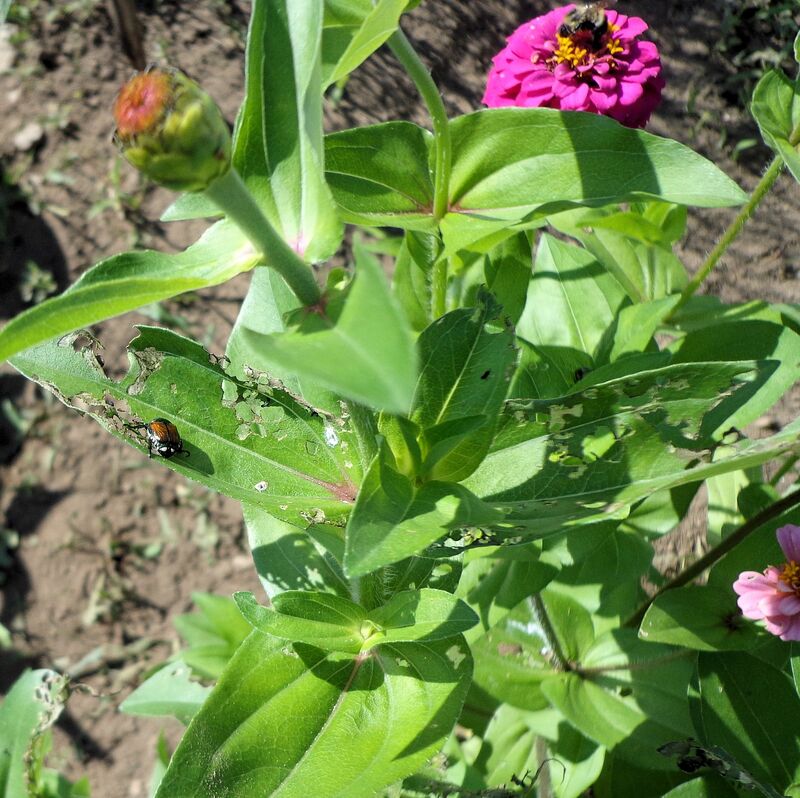 The Japanese beetles were devouring the zinnias. Finally I dusted them with insecticide and the plants have started to bloom. No bugs bother the marigolds, they have natural insecticides to keep pests away. Today’s cool temperature and fine mist is a welcome change from drought conditions and day after day in the 90s. Last night we had a thunderstorm with heavy rains. I can almost feel the plants breathing a deep sigh of relief at the much needed water. Despite the adverse conditions, the vegetable garden is doing well. The indian corn was knee high on the Fourth of July, so we’re right on schedule there. A few days ago I beat the weeds back with the mantis. Still need to rake the loosened weeds and throw them out. Also need to weed right around the plants again. I did that about two weeks ago. Weeds don’t seem fazed by drought. The red sweet peppers are doing much better than last year. I planted them closer together and am trying to make sure to give them plenty of water. They are all beginning to bloom. The beets are ready to be thinned for the greens. Can hardly wait for a steaming bowl full flavored with salt and butter, yum! Carrots are ready to be thinned as well. I already thinned the pumpkins and squash. They have out-grown the threat of squash bugs and cucumber beetles sucking the juices dry. I think it was a hard year for those bug pests, I didn’t see hardly any. Could be they don’t like very dry conditions. The tomatoes are blooming and some have several small fruit forming already. Can’t wait to harvest my first tomatoes! These Early Girls usually have fruit ready by the end of July. We’ll see how they do. The lack of rain may have slowed them down. I watered three times, but I suspect tomatoes like even more moisture. The wax bush beans are beginning to flower. Once flowers show up, watch out! There will be beans to harvest in no time. I still have about a dozen cans of beans left from last summer. That’s ok, never too many beans. 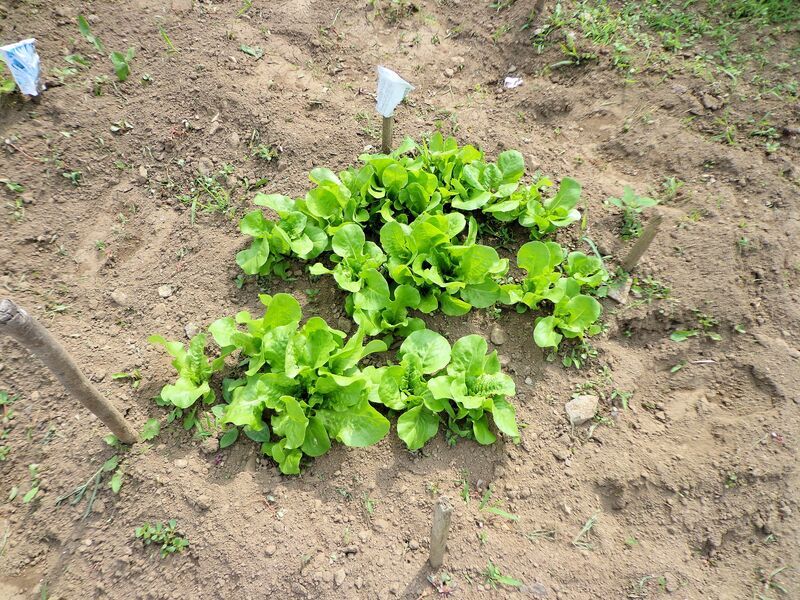 I planted head lettuce that is ready to be thinned and also beds of marigolds, zinnias and bachelor buttons. One bachelor button plant volunteered from last year and has lots of pretty mauve flowers already. Always enjoy a little color in the vegetable garden. The sunflowers struggled a bit, but are now growing well. Most are about a foot tall. Once they get this big, they begin to shoot toward the sky, nearly doubling in size every week until they reach six to seven feet. They will be covered with bunches of small blooms that later form black oil seeds for the birds. So, everything is growing right along here in the garden. Am hoping the rain returns more frequently so I don’t have to water too much. We’ll check back in a couple weeks to see how things are going. 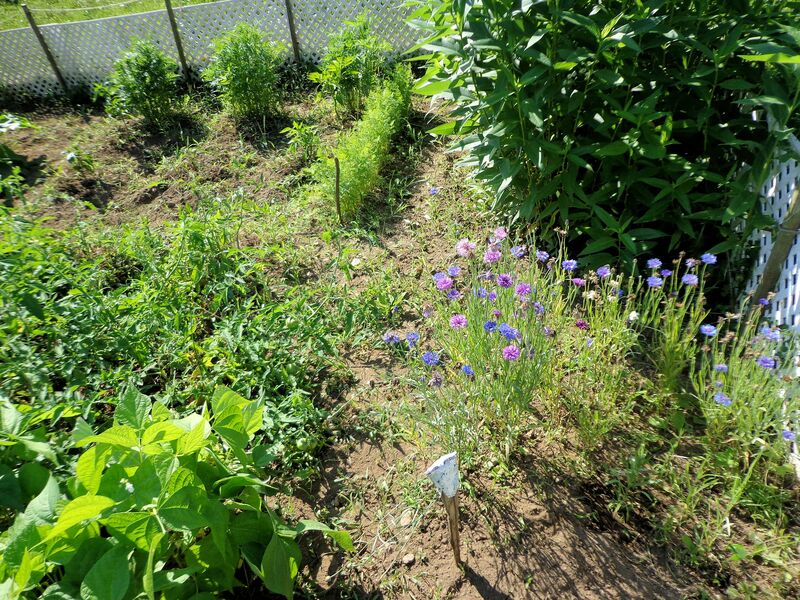 Despite plentiful sunshine and rain, June was a slow month for the garden. The plants seemed to lag. 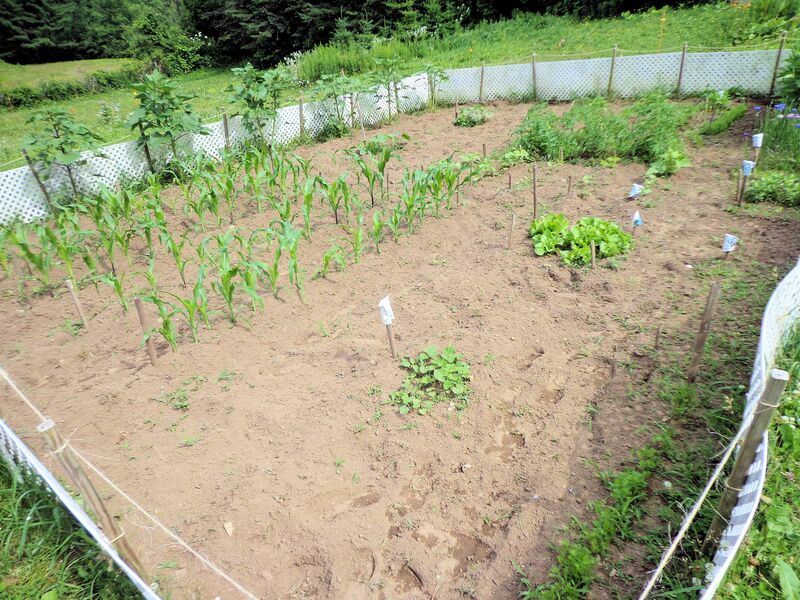 The photo above was taken July 9th, right after I tilled with the Mantis to reduce the weeds. 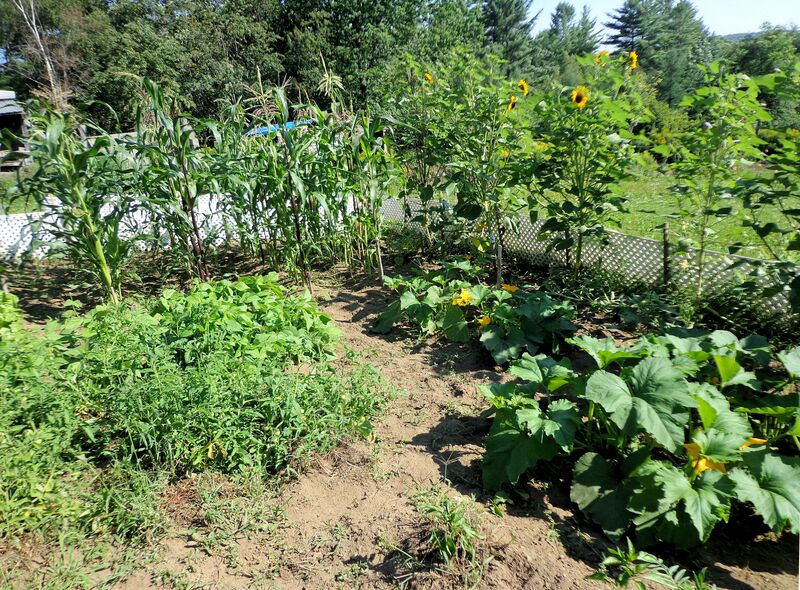 Perhaps the weeds were exerting a dampening effect on the vegetables because the growth has been noticeable since weeding. The photo below was taken this morning. 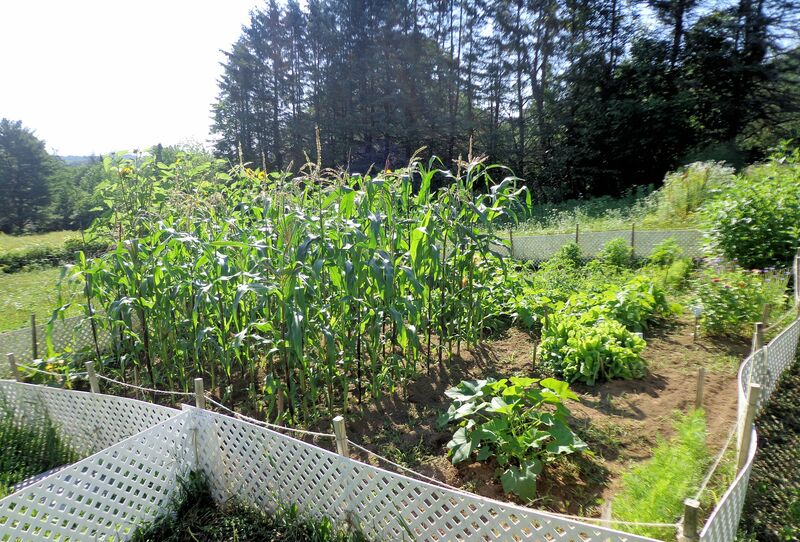 The corn, lettuce, zinnias and carrots have surged. The squashes are starting to gain some momentum. Weeds are also creeping back and will require hand removal. It may be that once a plant reaches a certain critical mass, the growth is faster. The early days could also be spent developing a root system that is not visible to the impatient gardener. The weeds were growing mostly in the pathways and open areas, I try to keep the immediate vicinity of the vegetables weeded by hand. Just the presence of so many other plants could possibly affect my domestic babies. We learn more and more of how plants do battle under the ground, emitting chemicals through their roots to impact each other’s growth. Wild weeds have a determination to grow that their softer, coddled garden cousins lack. Indian corn reaches heights of seven feet or more, adding inches every day during this hot and humid cornscateous weather. 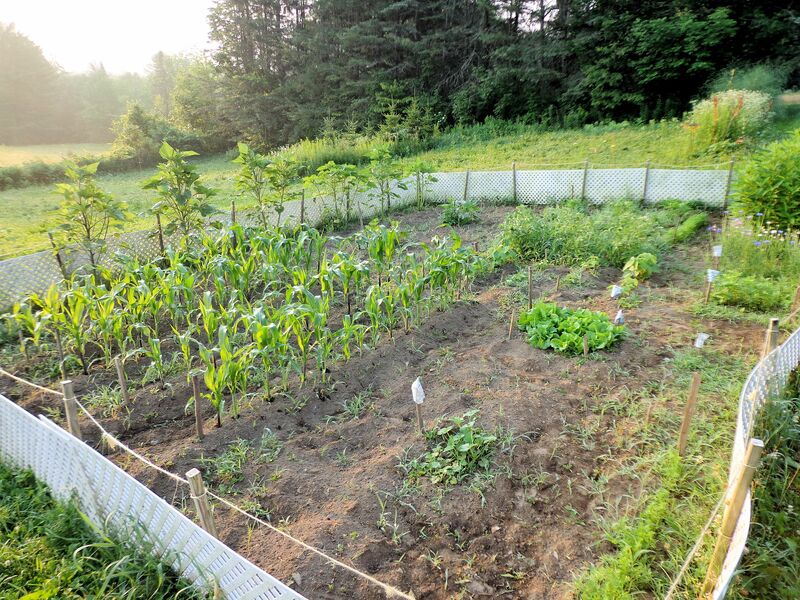 After tilling last week, I hoed the soil into mounds six inches tall around the base of each corn plant to encourage the growth of their secondary roots. 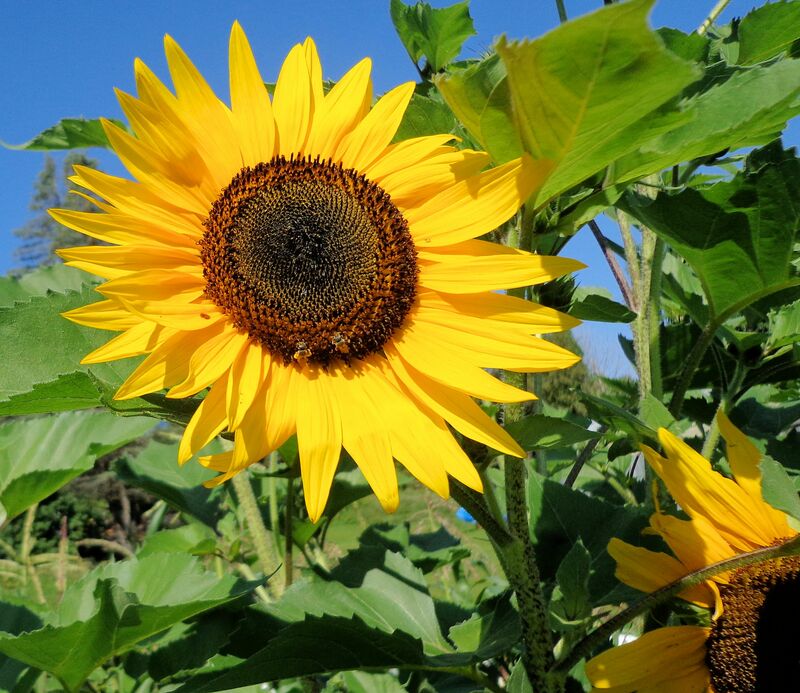 These help anchor the tall stalks during high winds from thunderstorms and freak tropical storms. I also weeded and hoed the soil up around the wax beans. 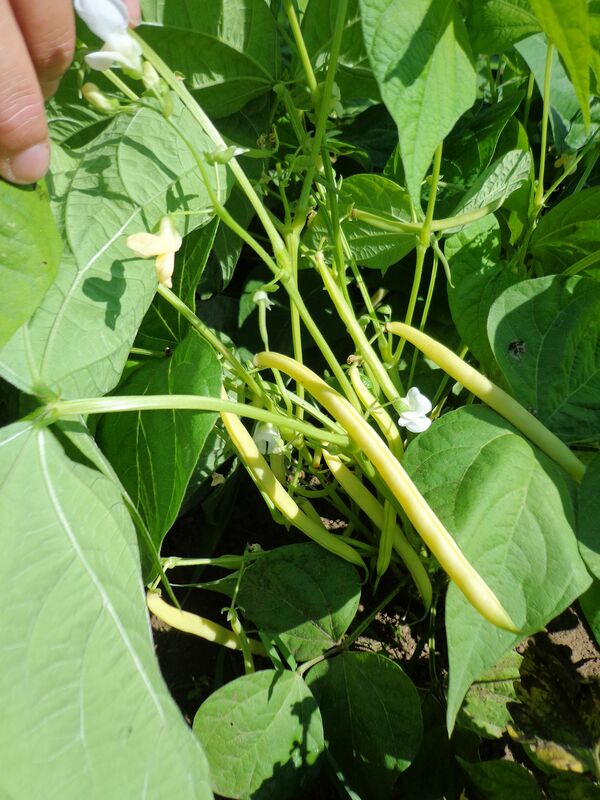 This plant does not do well against weed competition and requires plenty of support around its long stem to hold up the developing burden of beans. 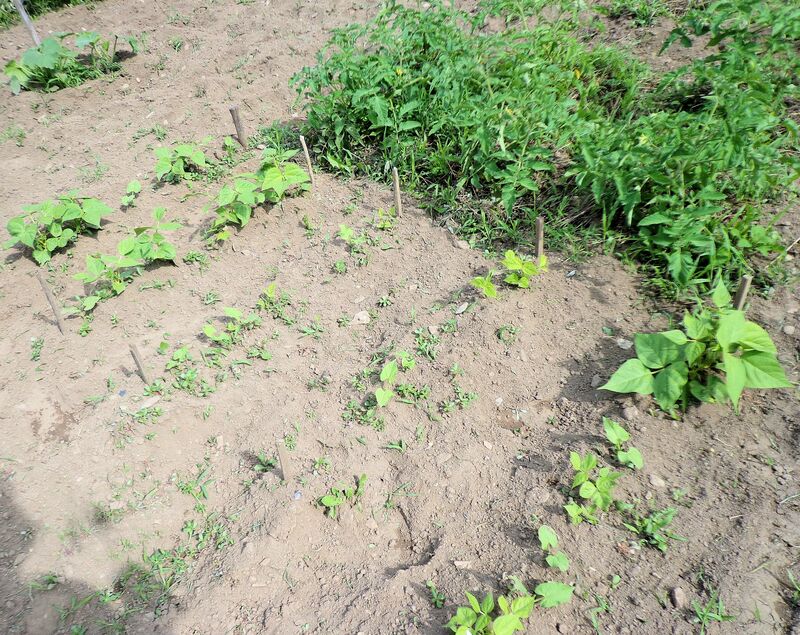 Due to the spotty germination of the beans, I had to reseed, hence the marked difference in the size of the plants in each row. The second planting was more successful than the first. The rows should fill in nicely now. The bean patch may appear small, but I have confidence it will produce a bountiful crop. 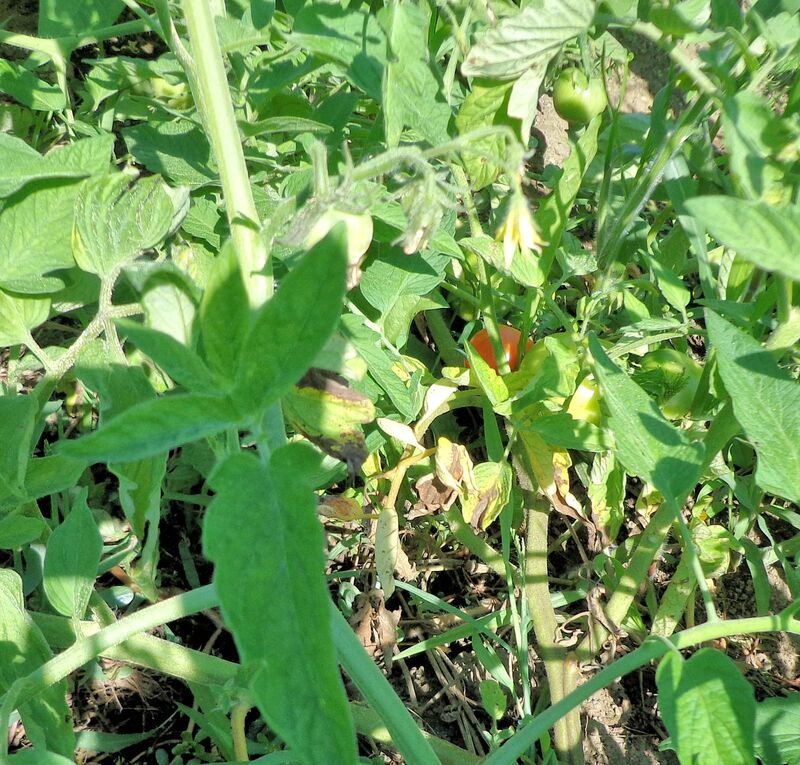 In the tomato jungle, several plants have green fruits on them. One tomato is even starting to get a whitish hue indicating it will ripen soon. I can hardly wait to eat tomatoes from my own garden! The flavor is superior to anything available in stores. 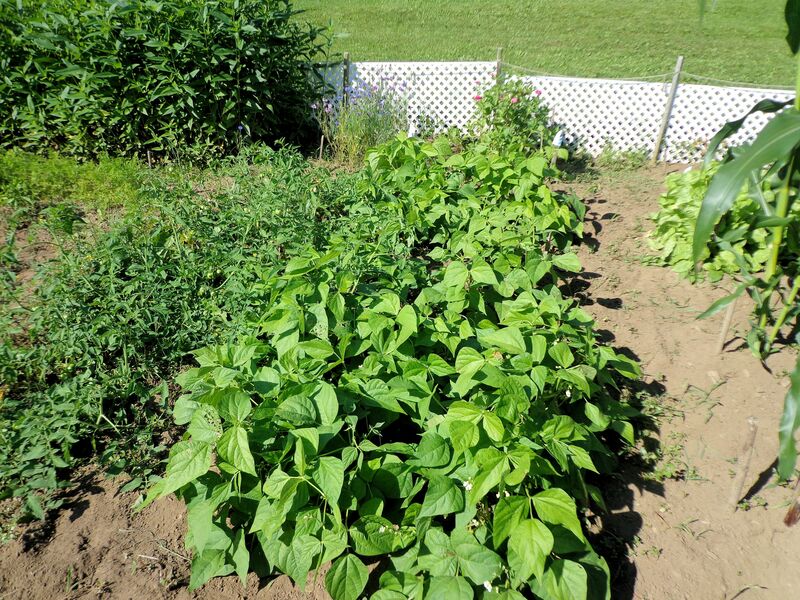 In the background, the sweet peppers are visible amongst the weeds. They are blooming and have formed a couple baby peppers. 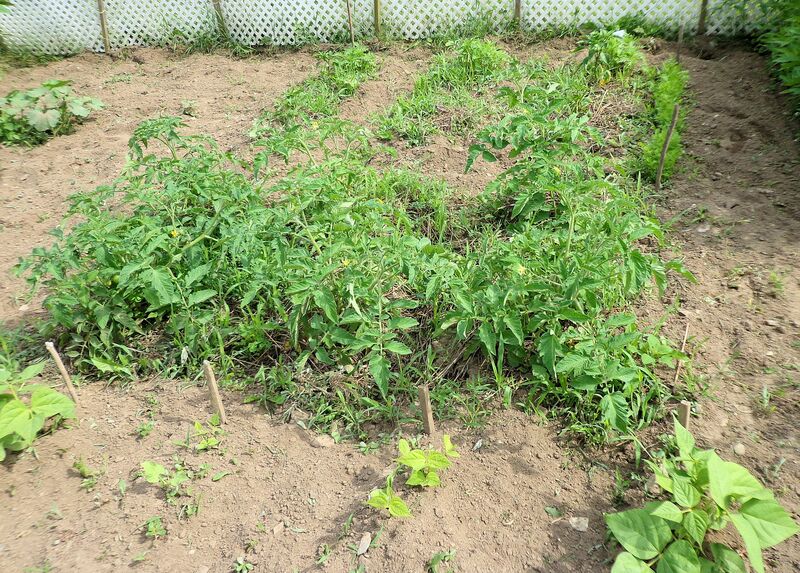 I will hand pull the weeds and apply more mulch to the peppers and tomatoes. 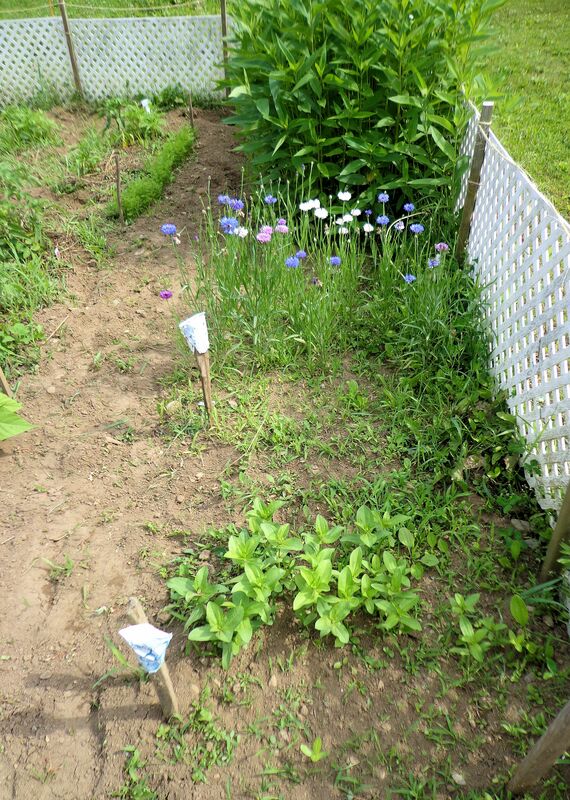 At the very end of the pepper rows are massed plantings of marigolds that should soon begin to bloom. This year I am growing more flowers with the vegetables. The bachelor buttons that volunteered from last year are covered with blooms. Zinnias are showing buds. The straw flowers trouble me. I am not sure that any sprouted. That part of the garden may remain empty. Since I don’t know what a baby straw flower looks like, I’ve been removing obvious weeds from the area and hoping the some of the unfamiliar ones might be what I want. Time will tell. If no straw flowers show up, I might put a few more carrots in the area. Carrots can be seeded throughout the summer because they grow fast and will make a fall crop. 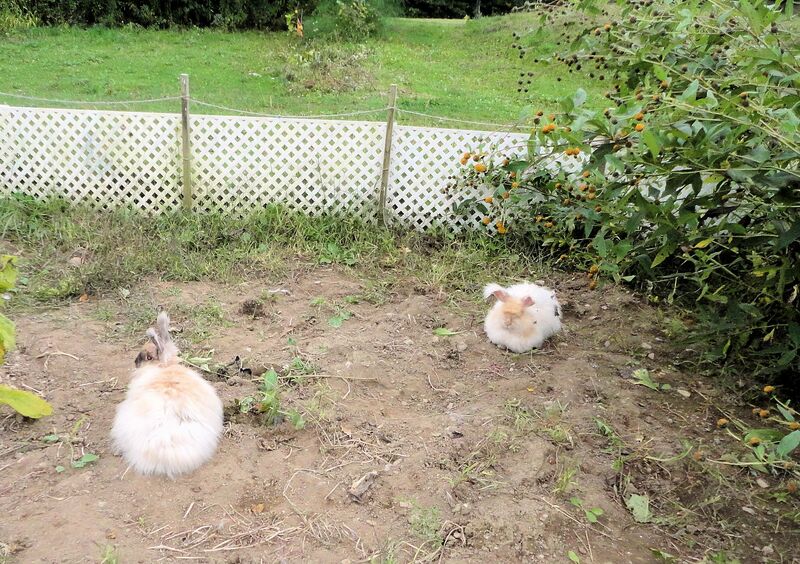 Now that the garden is almost harvested and they really can’t do any harm, I let the angora bunnies romp around inside the fenced area. It must be bunny’s best time ever! 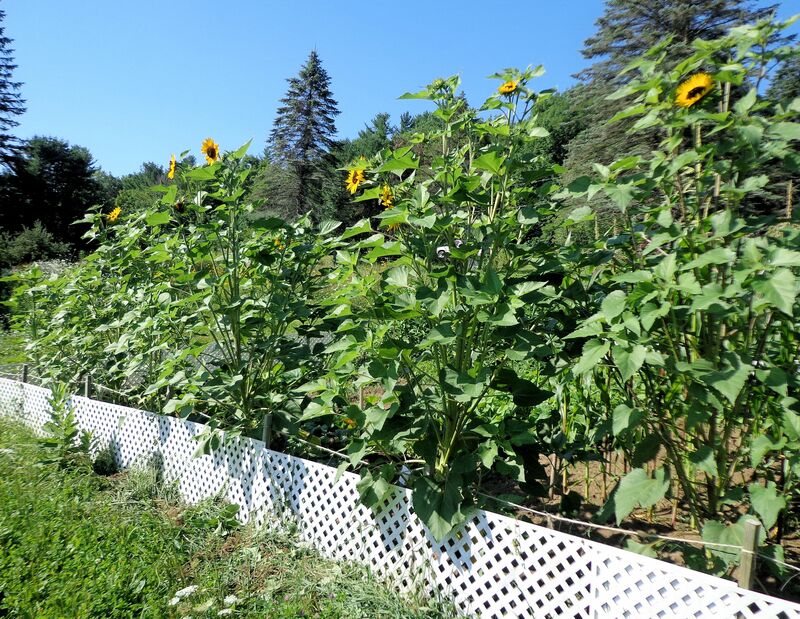 The garden is 24 ft by 36 ft with a two foot tall lattice fence that sets up on a berm around the edge. A perfect place to let bunnies get some exercise. Today, three of my does, Gem, Citrine and Alabaster are enjoying the freedom. Alabaster snuffled around in the dirt and got her nose all messy. These rabbits are pretty excited about having so much room to run and so many places to explore. They barely stop to nibble grass, dandelions and other stray weeds, or even the left-over carrot tops that dropped here and there. Too much to explore, no time for eating! 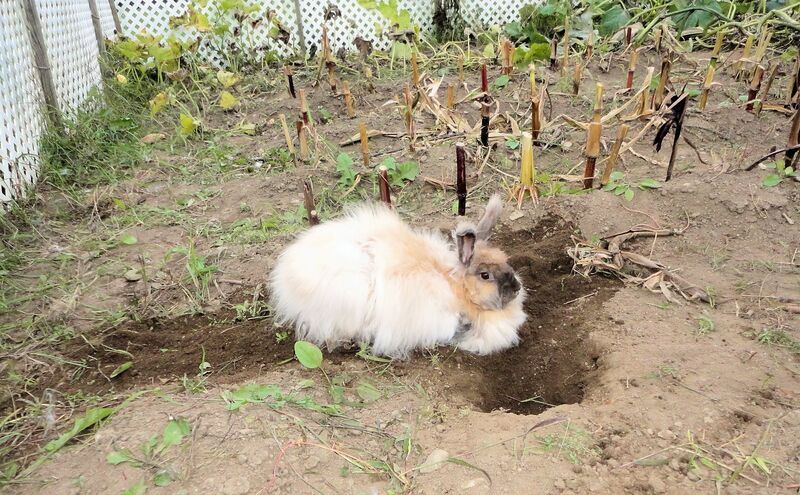 Citrine decided to try digging a hole, there is so much dirt, it’s hard to resist scrabbling in it. 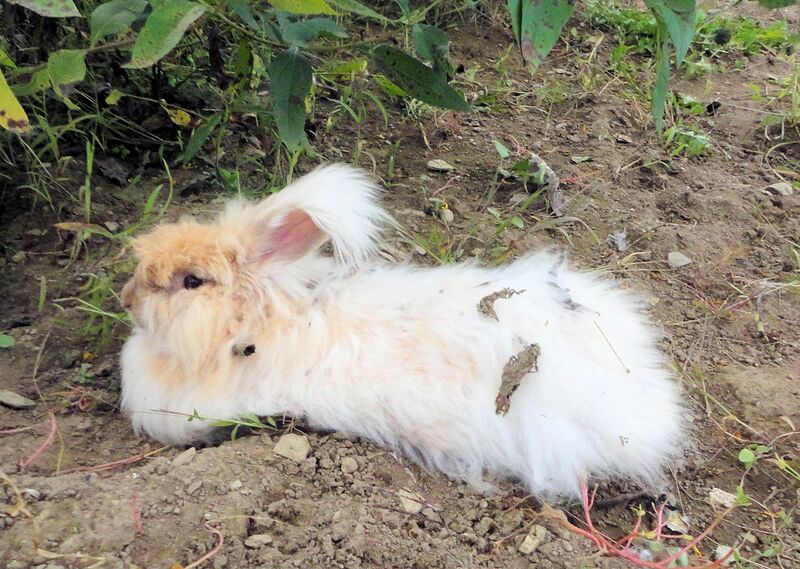 The dirt is also cool and a lovely place to stretch out a belly. 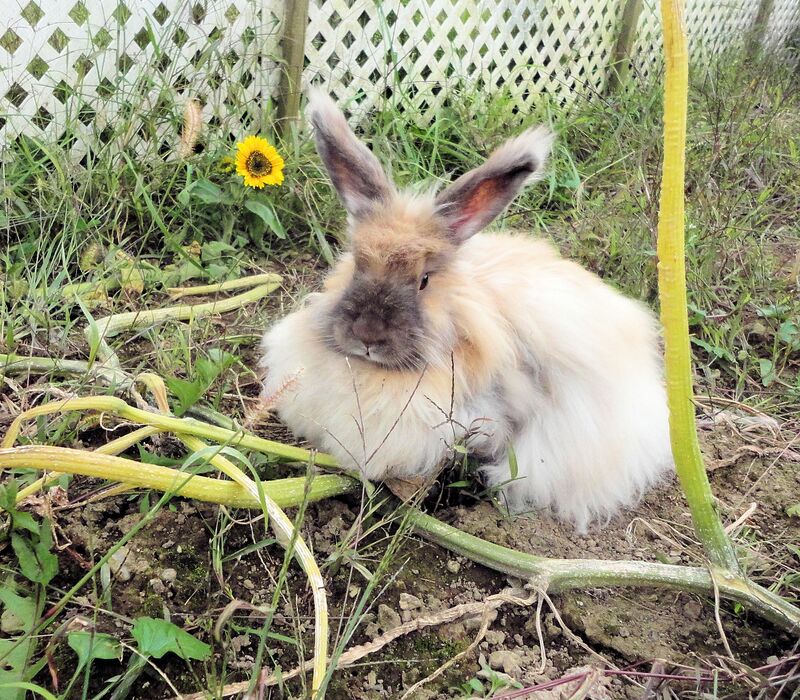 Gem has been hunting around under the Jerusalem artichokes and picked up a bunch of dried leaves on her coat. Plenty of work for me to groom the bunnies out after their fun. 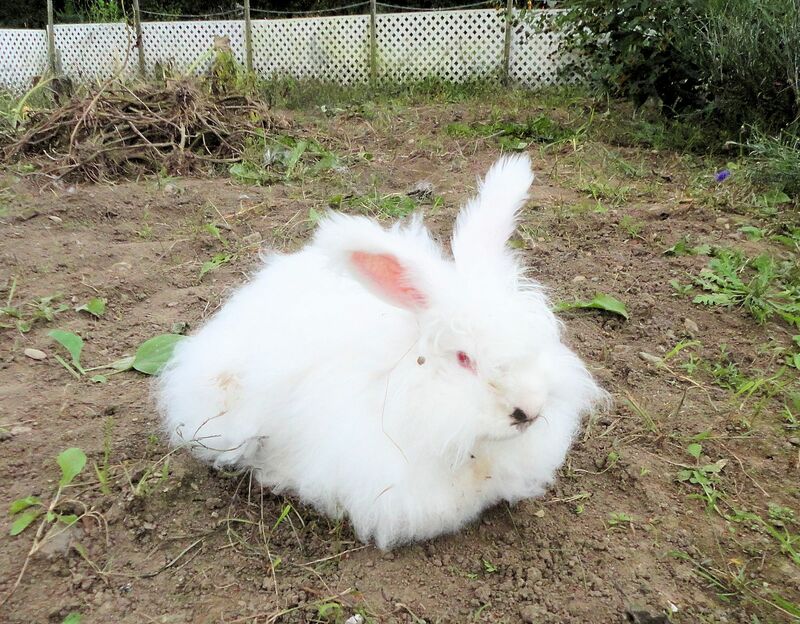 The angora rabbits can’t run for long distances, they get overheated. In the garden they take time to just relax and enjoy a place with no wire walls or floor. 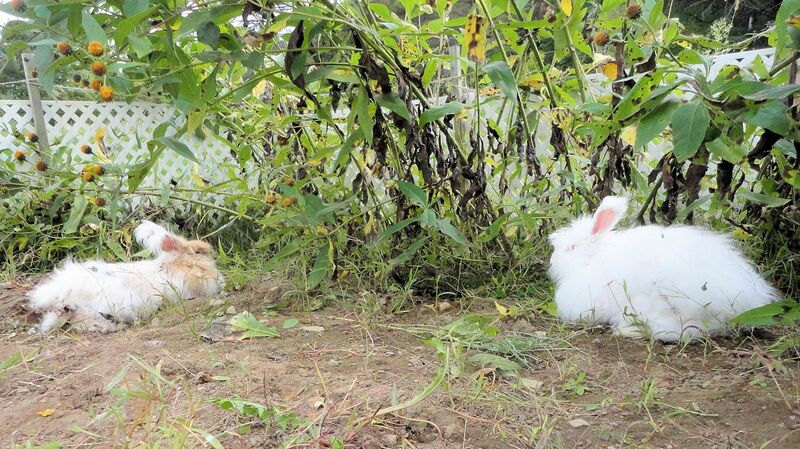 All the rabbits have had a chance to run in the garden. 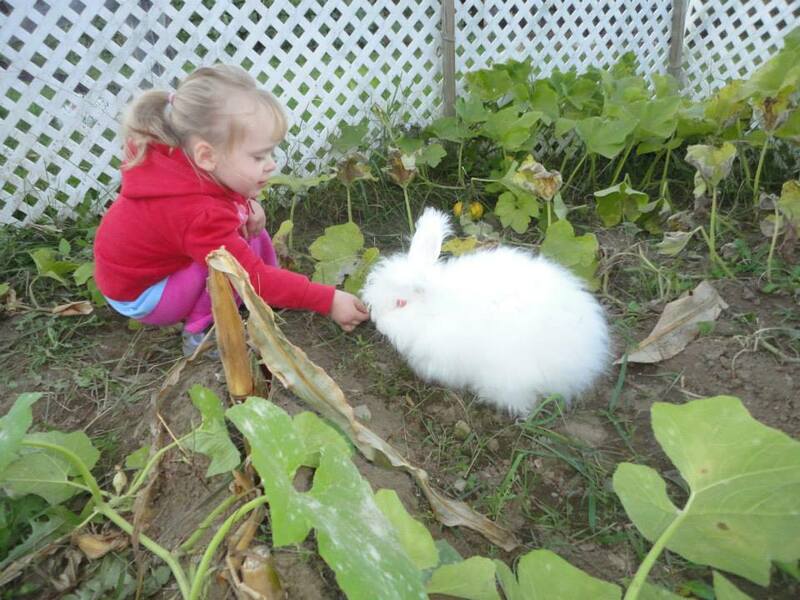 A couple days ago, my old buck, Jasper, who is nine, visited with my granddaughter Lia while I pulled the carrots.